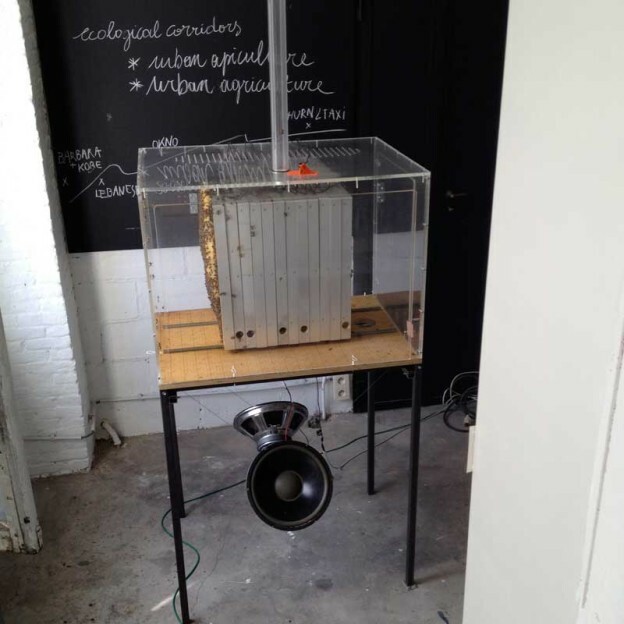 The Bee Laboratory project monitors the behaviour of honeybees in urban surroundings. Beekeepers, scientists and artists examine the bee colonies in our rooftop gardens, our open air laboratories. We study the distributed intelligence of the honeybees : their behaviour, ecology and sociobiology. We monitor the bees and beehives with all kinds of eco-technology and we study the colony as a community. We research the interaction between the different colonies as well as the colonies’ behaviour and development in relation to the urban environment. The monitoring project offers the opportunity to study the bee colonies as bio-indicators. Bio-indicators reflect the health of the ecosystem, they can tell us about the cumulative effects of different pollutants. A bee population functions and evolves very much in accordance to the human activities we are developing around them: gardening and urban agriculture. The production of honey is different related to the flowers we grow, the plants we like, the garbage or pollution we produce. In our experimental set-ups we work with different kinds of sustainable beehives, and we also build our own observation hives. These hives are augmented with sensors and sensory processing algorithms that analyse the quality of pollen and propolis as well as the behavior of the bees in order to monitor the state of the ecology in the surrounding areas. The ‘Intelligent Beehives’ are distributed in a European network and the data are available online. The initial setup is located in 2 rooftop gardens in the center of Brussels, at about half a kilometer distance from each other. I installed several beehives in both of the gardens. The bees bridge the spatial distance by foraging in overlapping territories. Since each colony will be active in a radius of 3 kilometers from their hive, the respective trajectories and individual territories will be overlapping and a new space of encounter can be defined. 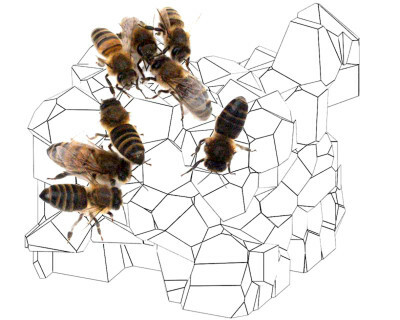 A new perception of neighborhood can be realized through the ‘eye of the bees’. Observing and monitoring the activities of the hives coupled with ongoing documentation of each individual hive as well as the interaction between the different colonies will be performed. Information can be obtained from bee hives through visually observing, by listening or smelling. Changes of the hives can be monitored in terms of weight, size or outside/inside temperature of the habitation/colony and via the honey amount or quality. This data has abundant environmental information value, but can also be used and made available in a more indirect/symbolic way, as in artworks. But we have also another motivation. In many industrialised nations, bee colonies are now threatened. There are many causes – amongst them pesticides and parasites – but the compromised state of the foraging areas for bees is just as worrisome. So we also work towards an improvement of the environment of bees with the creation of urban gardens and guerilla planting. Moreover, because bees reflect the health of their surrounding ecosystem and the cumulative effects of different pollutants, we use them as bio-indicators to make citizens aware of the increasingly negative effects of our life styles and methods of industrial production. 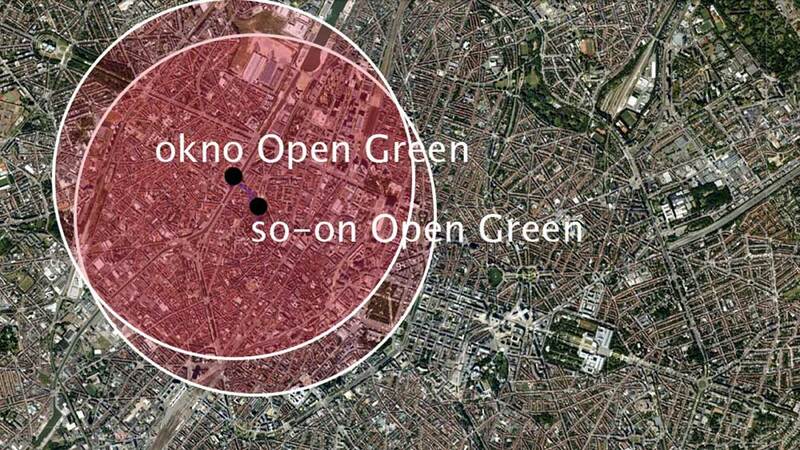 More specifically, we have set out several urban test fields in the Brussels’ Canal Zone. This area features diverse activities: from community gardening and urban agriculture to accidental nature, interspersed between industrial buildings, office zones and living areas. Our test sites are connected by the flight routes and foraging activities of the bees. They create a green corridor in the city. 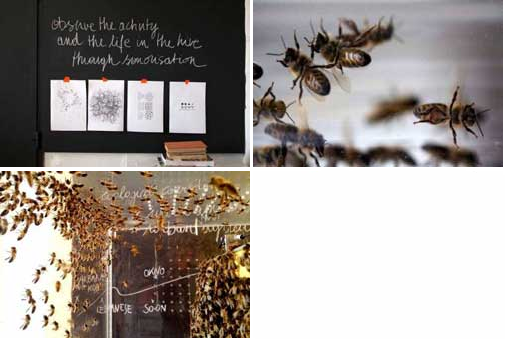 The Bee Laboratory & UrbanBeeResearch should be seen as an open framework. It is a long-term project on the edge of art, science and technology. The project is a collaboration between the artists, designers and engineers from okno.be, annemariemaes.net, the computer scientists ofthe VUB – artificial intelligence laboratory (Prof. Bart de Boer, Free University Brussels) and the Sony Computer Research Laboratory Paris – sustainability group (Ing.Dr. Peter Hanappe).